After a hiatus of no less than 14 years, Sweden's death metal pioneers return with their fourth studio album Counting Our Scars, released by Singapore-based Pulverised Records. Featuring polished melodic death metal played at a higher tempo, the album is consistently good. There may be few exceptional highlights to cause pause, but equally few weak moments. The vocals of Klas Morberg are a deep, low growl, mixed almost into the background. The band creates an impressive wall of sound in front of him, and in the absence of solos what Desultory lacks in inspiration they make up for in pure heft. The better tracks find a sharper edge in terms of hooks and playful melodies. Ready To Bleed serves up a clever riff and bolts it on to an immense buzz. The Moment Is Gone is the longest (at just under 6 minutes) and most epic-oriented track on the album, slowing the pace down in search of a heroic quest. The album's production values are noticeably rudimentary. The sound is muffled and condensed, handicapping the band's complex execution. 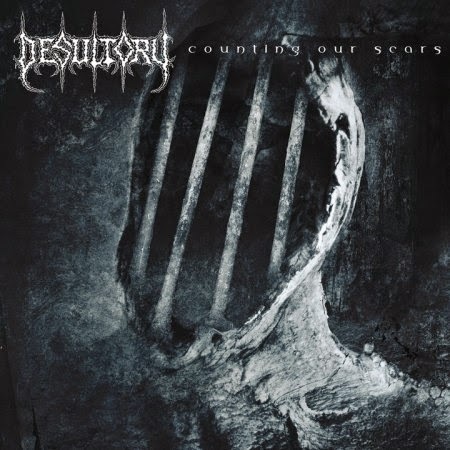 Desultory overcome what sounds like a low budget and remain sturdy for the full count. Engineered, Mixed and Mastered by Tore Stjerna.